Developed for high performance vehicles, the Conti Sport Contact 3 offers excellent safety whilst driving at speed. 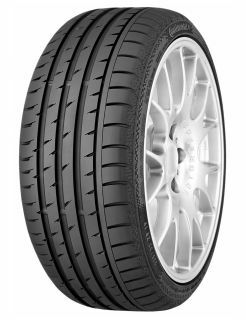 This tyre has been constructed with asymmetric tread ribs which work to absorb the forces which act upon them at high speeds, so that it maintains contact with the road and allows for agile steering precision. This also allows for a superior cornering performance. The Conti Sport Contact 3 is reliable when it comes to performing in wet weather and was awarded a 'B' Grade for its wet grip performance by the EU Tyre Label.